When I was 14 my grandmother bought me a drum kit for my birthday. It was a Slingerland kit with the Aztek finish. I loved that drum kit and a picture can be seen in this post. Mentioned in that post are the two albums I listened to over and over. 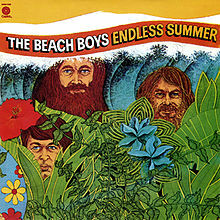 One of those, the Beach Boys Endless Summer, still stands up today. Learning to play the drums with headphones and an 8 track player was not as easy as it sounds but it was a lot of fun. I’m sure the constant 4/4 rhythm heard throughout the house had to be maddening, but my parents never said a word. I learned every sone on that album and bet I could still play it song for song today. I Get Around, True To Your School and Surfin USA were just some of the great songs on the double album. Don’t Worry Baby and In My Room were two of the slower tracks, but both spoke to me. things are different today, and I’m not sure the pure joy of playing to a set of songs seems old fashioned today. That’s too bad.